Background and objectives Laparoscopic hysterectomy is increasingly performed because it is associated with less postoperative pain and earlier recovery as compared with open abdominal hysterectomy. The aim of this systematic review was to evaluate the available literature regarding the management of pain after laparoscopic hysterectomy. Strategy and selection criteria Randomized controlled trials evaluating postoperative pain after laparoscopic hysterectomy published between January 1996 and May 2018 were retrieved, according to the Preferred Reporting Items for Systematic Reviews and Meta-Analyses guidelines, from the EMBASE and MEDLINE databases and the Cochrane Register of Controlled Trials. Efficacy and adverse effects of analgesic techniques were assessed. Results Of the 281 studies initially identified, 56 were included. Of these, 31 assessed analgesic or anesthetic interventions and 25 assessed surgical interventions. Acetaminophen, non-steroidal anti-inflammatory drugs, and dexamethasone reduced opioid consumption. Limited evidence hindered recommendations on alpha-2-agonists. Inconsistent evidence was found in the studies investigating pregabalin and transversus abdominis plane block, and no evidence was found for intraperitoneal local anesthetics, port site infiltration, or single-port laparoscopy. Measures to lower peritoneal insufflation pressure or humidify or heat insufflated gas seem to reduce the incidence of shoulder pain, but not abdominal pain. Conclusions The baseline analgesic regimen for laparoscopic hysterectomy should include acetaminophen, a non-steroidal anti-inflammatory drug, dexamethasone, and opioids as rescue analgesics. Hysterectomy is one of the most common major surgical procedures performed in women. The laparoscopic approach is increasingly used, as it is associated with reduced postoperative pain and morbidity, as well as earlier recovery and a shorter hospital stay when compared with open hysterectomy.1–5 However, pain may still be quite severe, particularly in the early postoperative period.6 7 Literature assessing non-opioid pain therapy for patients undergoing vaginal and laparoscopic hysterectomy has been recently evaluated.8 However, this study was not truly procedure-specific, including both vaginal and laparoscopic hysterectomies, and did not focus on opioid analgesics, anesthetics, and surgical technique. The PROSPECT (PROcedure-SPECific postoperative pain managemenT) Working Group is a collaboration of anesthesiologists and surgeons which formulates evidence-based recommendations for postoperative pain management that are specific for different surgical procedures.9 10 In addition to procedure-specific evidence, clinical practice information is used to provide overall recommendations considering the efficacy and adverse effects of an analgesic technique (www.postoppain.org). The aim of this systematic review was to evaluate the available literature on the management of pain after laparoscopic hysterectomy. Postoperative pain outcomes (pain scores and analgesic requirements) were the primary focus, but other recovery outcomes, including adverse effects, were also assessed, when reported, and the limitations of the data were reviewed. The ultimate aim was to use the available evidence to develop recommendations for pain management in this patient population. A systematic review of randomized controlled trials (RCTs) published between January 1996 and May 2018 assessing analgesic interventions for laparoscopic hysterectomy was performed according to the Preferred Reporting Items for Systematic Reviews and Meta-Analyses guidelines using EMBASE, PubMed, and the Cochrane Register of Controlled Trials.11 The search terms related to pain interventions for laparoscopic hysterectomy surgery without language restriction included “laparoscopic hysterectomy” AND (“postoperative pain” OR “analgesia” OR “visual analog score” OR “local anesthetic” OR “regional anesthesia” OR “regional analgesia” OR “infiltration” OR “TAP block” OR “nonsteroidal antiinflammatory drugs” OR “non opioid analgesic” OR “opioid” OR “dexamethasone” OR “gabapentin” OR “pregabalin” OR “ketamine” OR “paracetamol” OR “acetaminophen” OR “corticosteroids”). We also manually retrieved publications referred in studies identified by our preceding search. We included RCTs assessing analgesic, anesthetic, or surgical interventions for laparoscopic hysterectomy with pain intensity measured by Visual Analog Scale (VAS) or Numerical Rating Scale (NRS). Studies that did not measure pain intensity and studies including laparoscopic hysterectomy that reported data pooled with other surgical procedures were excluded. Three authors (JT, PL, and M-PB) conducted the literature search, while four authors (JT, M-PB, PL, and FB) were involved in the review of the literature search and exclusion of irrelevant articles where ambiguous. The results of the literature search were grouped according to analgesic modality and presented to the entire Working Group (see list of Authors) in two subsequent meetings half a year apart. The authors proposed interpretations of the findings, and the entire group was engaged in the drafting of the final recommendations in several iterations, collating rounds of individual comments on the evidence and draft recommendations, followed by round-table discussions and further rounds of individual comments. When consensus had been obtained, the lead authors compiled the manuscript, and again all the Working Group members participated actively in the writing and discussion. The methodology of the PROSPECT group is unique in that it aims to synthesize clinical evidence while considering the risks and benefits of interventions as well as taking into account study design. Specifically, the group seeks to determine the relevance of study interventions in current perioperative care practice and critically evaluate the baseline pain treatment. Recommendations are given when at least two congruent studies support an intervention. A total of 281 studies assessing analgesic interventions for laparoscopic hysterectomy were identified (figure 1). Of these, 23 retrospective studies, 31 non-randomized prospective, and 153 other publications were excluded. Of the remaining 74 RCTs, 18 studies were excluded (9 studies did not provide reproducible evaluation of pain, 2 studies expressed the results in figures and data could not be validated, and 7 studies did not provide data specifically for laparoscopic hysterectomy as data were pooled with other surgical procedures). Thus, 56 RCTs were included, 31 concerning analgesic or anesthetic treatments, and 25 concerning surgical procedures (figure 1). PRISMA flow chart of literature search. PRISMA, Preferred Reporting Items for Systematic Reviews and Meta-Analyses. The quality scores of all the studies reviewed (allocation concealment, Jadad score, and level of evidence) are reported in table 2, while details on analgesic interventions are given in table 3. For the qualitative analysis, the included trials were divided into three groups—analgesic interventions, anesthetic interventions, and surgical procedures. In summary, administration of non-opioid drugs such as acetaminophen, ketorolac, or nefopam has an opioid-sparing effect, but effects on mobilization and opioid-related side effects are unclear. Even though not powered to detect such an outcome variation, neither of the studies using non-opioids reported excessive bleeding in the non-steroidal anti-inflammatory drug (NSAID) groups. In summary, dexamethasone seems to exhibit dose-dependent opioid-sparing effects and contributes to reducing PONV, but does not reduce pain scores. The pre-emptive analgesic effect of two doses of pregabalin (300 mg and 600 mg) or diazepam (10 mg) was compared in a three-arm study, with the medications given as premedication and after 12 hours.22 Only opioids were administered on the day of surgery. The VAS scores for pain at rest, on movement, and on coughing were comparable in the three study groups. The cumulative dose of oxycodone (0–24 hours after surgery) was lower in the pregabalin 600 mg group as compared with the diazepam group, but patients receiving pregabalin suffered from side effects such as dizziness, blurred vision, and headaches more frequently. Asgari and colleagues23 randomized 96 patients to two preoperative and one postoperative dose of pregabalin 75, 150, or 300 mg, or placebo (n=24 each). The authors found that both 150 mg and 300 mg of pregabalin decreased pain scores, but in the 300 mg group the sedation score was significantly higher than in the placebo and the lower dosed groups.23 Curiously, not a single patient in the pregabalin 300 mg and the placebo group required any rescue opioids despite the fact that no standardized multimodal regimen was used. In conclusion, pregabalin has potential opioid-sparing effects, but especially at higher doses it may be associated with side effects precluding its widespread use. Kim and colleagues24 investigated the effects of different doses of dexmedetomidine on postoperative shivering. In patients receiving 1 μg/kg body weight of dexmedetomidine, time to rescue analgesic was prolonged by, on average, 11 min as compared with placebo, and the number of patients requiring rescue analgesics in the postanesthesia care unit (PACU) (93% of control patients) was reduced to 50% and 43% in patients receiving 0.75 and 1 μg/kg body weight, respectively. A study compared intravenous infusions of dexmedetomidine/ketorolac (n=25) with remifentanil/ketorolac (n=25) administered from the end of surgery to the arrival in the PACU.25 The early VAS scores were not significantly different between the two groups until 30 min after PACU arrival, when the study ended. In conclusion, there are insufficient data to form a recommendation for dexmedetomidine. When Choi and colleagues26 compared different brief analgesic infusions at the end of surgery, they found no difference in pain scores or analgesic side effects between remifentanil, fentanyl, and dexmedetomidine. The pre-emptive analgesic effects of epidural analgesia were compared with epidural analgesia started after skin closure in patients with cervical cancer scheduled for laparoscopic hysterectomy. Continuous epidural analgesia using a patient-controlled epidural analgesia (PCEA, lidocaine and morphine) was continued for 72 hours. In the pre-emptive epidural analgesia group, pain scores and rescue PCEA opioid consumption were lower, and side effects nausea, vomiting, and pruritus were reduced, as compared with epidural analgesia initiated after the end of surgery.33 During surgery, after the initial top-up in the pre-emptive group, blood pressure was slightly lower than baseline, while in the group that had not received an epidural bolus blood pressure was higher than baseline. The overall recovery effect of this 72-hour regimen compared with other simple multimodal opioid-sparing techniques was not determined. Patients in the pre-emptive epidural group had median pain scores of less than 4 after surgery and less than 3 at 3 hours postoperatively, whereas the control group reached similar pain control only between 12 and 24 hours after surgery. The efficacy of ultrasound-guided transversus abdominis plane (TAP) block was assessed in several studies. De Oliveira and coworkers34 compared two concentrations of ropivacaine (5 mg/mL or 2.5 mg/mL) with saline for TAP block and found lower NRS pain scores in the ropivacaine groups by 2–3 points in the PACU, and at 24 hours, and in addition lower opioid consumption in the 5 mg/mL ropivacaine group as compared with saline (7.5 vs 15 mg morphine equivalent). Importantly, this study used standard multimodal analgesia (opioid, acetaminophen, ibuprofen) in all patients. When comparing TAP block with no block, Kane and colleagues35 found no differences in pain scores or opioid requirements. In this study, intraoperative and postoperative titration of analgesics was at the discretion of the treating doctors, and all patients received NSAID. Calle and colleagues36 compared TAP block with placebo in the setting of ambulatory laparoscopic hysterectomy and found a lower VAS score at discharge in the TAP group (by less than 1 point on the NRS), which was statistically but not clinically relevant, while no difference was observed at 12 or 24 hours when patients received a standard baseline analgesic regimen including ibuprofen and acetaminophen. Of note, the TAP block in this study was performed using the loss-of-resistance technique without ultrasound, under laparoscopic vision. In another study, when compared with trocar site infiltration in the setting of multimodal analgesia, single-shot ultrasound-guided TAP block decreased neither pain scores to a clinically significant extent (mean difference less than 1 point on the NRS), nor intraoperative or postoperative opioid use or antiemetic prescription.37 Torup and colleagues38 investigated the use of TAP block when added to multimodal analgesia (two non-opioids, morphine PCA) and found no additional benefit concerning pain scores when compared with placebo blocks, no reduction in opioid use, and no difference in adverse events. Hutchins and colleagues39 investigated the use of liposomal bupivacaine compared with plain bupivacaine for subcostal TAP block in patients undergoing robotic-assisted laparoscopic hysterectomy. There was no clinically significant difference in median maximal pain scores in the immediate postoperative period, but the liposomal bupivacaine group had decreased maximum pain scores, decreased opioid use, and a lower incidence of PONV for the first 24 hours.39 Ghisi and coworkers40 compared ultrasound-guided TAP block with systemic opioid analgesia and found no advantage in terms of VAS score, opioid consumption, postoperative mobilization, or adverse events. Finally, Guardabassi and colleagues41 found no advantage in terms of opioid consumption during the first 24 hours, and no difference in pain scores, when TAP blocks were added to a systemic analgesia regimen including opioid PCA. Two studies investigating different regimens of local anesthetics used for intraperitoneal instillation of local anesthetics demonstrated no clinically relevant benefit. Arden and coworkers42 compared the instillation of local anesthetic in the pelvic region, but not the trocar insertion sites, with saline placebo and found no difference in VAS scores or adverse events. Andrews and colleagues43 investigated continuous intraperitoneal infusion of 5 mg/mL levobupivacaine at 2 mL/hour for 48 hours as compared with saline placebo, and found higher postoperative analgesic requests in the levobupivacaine group while attaining comparable pain scores. As indicated above, the efficacy of bupivacaine port site infiltration and ketorolac administration was compared in a four-arm study, where the lowest pain scores during the first 6 hours following surgery were found in the group which received both port site infiltration and ketorolac.16 Also, in the setting of multimodal analgesia, patients receiving trocar site infiltration reported the same (low) pain scores as patients receiving single-shot ultrasound-guided TAP blocks.37 Barron and colleagues44 showed that port site infiltration with liposomal bupivacaine, when compared with plain bupivacaine, showed lower pain scores on postoperative days 2 and 3, with no difference in opioid consumption, psychometrics, or analgesic side effects. In summary, based on one well-designed study, epidural analgesia started before skin incision provided adequate analgesia postoperatively. TAP blocks were less effective, with four out of seven studies negative, two studies positive on the margin of clinical significance, and one positive study. Liposomal bupivacaine for TAP block, in one study, seemed to have a prolonged effect, and lowered worst pain scores during first 24 hours, as well as opioid consumption. Intraperitoneal local anesthetic infusion showed no analgesic benefits in the setting of laparoscopic hysterectomy. There is no procedure-specific evidence for port site infiltration. Surgical techniques are chosen based on anatomic and patient-centered factors, with postoperative pain scores playing a lesser role. Laparoscopic-assisted vaginal hysterectomy (LAVH) was shown in one study to lead to less pain compared with minilaparotomy,48 while the difference in a second study was minimal.49 Eggemann and colleagues50 found only minor differences in pain (less than 1 point on the NRS) when vaginal hysterectomy was compared with LAVH. Studies comparing single-port surgery versus minilaparotomy were mixed, with one study reporting less pain in the single-port group,51 while others finding no difference.52 53 Chung and colleagues54 reported more rescue analgesics in the single-port group when it was compared with a standard three-port surgery while other studies found no difference in pain scores or analgesics.55 56 Compared with single-port hysterectomy, minilaparoscopy led to lower pain scores in one study.57 No difference in pain scores and analgesics was found when robotic and conventional laparoscopic hysterectomy were compared.58 59 Laparoscopic combined hysterectomy was not different from conventional hysterectomy.60 Minilaparoscopy compared with conventional (larger-bore) hysterectomy led to no61 or only minimal62 decreases in pain scores. A study compared closed suction (Jackson-Pratt) drains with no drains.63 Shoulder tip, abdominal, and back pain were evaluated by measuring VAS scores at 3 hours, 24 hours, and 48 hours after surgery. Closed suction drains reduced shoulder tip pain at 24 hours. At 48 hours, fewer women who received drains experienced abdominal pain. There were no statistically significant differences in VAS scores for back pain at any time point. The oral analgesics demand was higher in patients with no drain. In summary, limited data suggest that small-port laparoscopy may decrease early and short-term postoperative pain, and low inflation pressure or humidified and heated CO2 may decrease shoulder tip pain, but not abdominal pain. 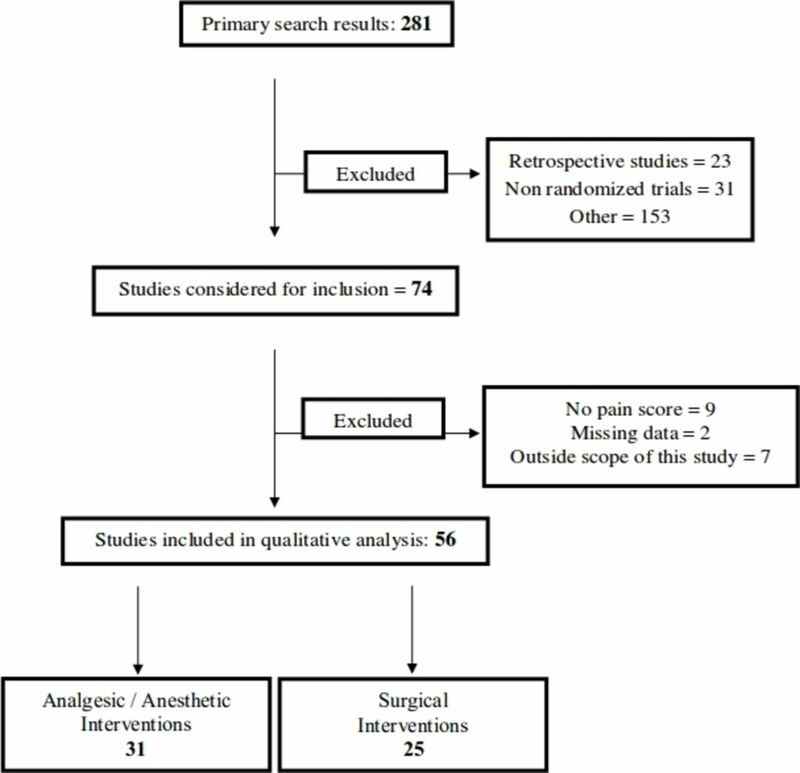 This systematic review examined the effects of analgesic, anesthetic, and surgical techniques on postoperative pain after laparoscopic hysterectomy. Evidence on epidural analgesia was limited, while evidence on TAP blocks was inconsistent, and that for intraperitoneal local anesthetics was negative. Epidural analgesia provides excellent pain relief for patients undergoing laparoscopic hysterectomy, but given the fact that surgery is now often performed on an ambulatory basis, and the adequacy of less invasive modalities in managing pain in most patients, it is performed very rarely74 and should be considered a reserve intervention. Several studies evaluated the use of TAP blocks for laparoscopic hysterectomy; however, the results are conflicting. When added to non-opioids and opioids, or compared with a simpler procedure such as port site infiltration,37 TAP block failed to consistently yield clinically significant benefits. Quality of studies did not seem to differentiate between positive and negative outcomes. One potential reason for the failure of TAP blocks in some trials may be the localization of port sites; depending on the size of the uterus and pathology, these may be placed at the level of and below the umbilicus, or above the umbilicus, and as mentioned others may use midline single-port techniques.35 So lateral TAP blocks may not be optimally suited for all types of laparoscopic hysterectomy, and subcostal blocks may be more appropriate for patients with more cranial port insertion points. There was also heterogeneity in block performance; some blocks were performed before surgery, while some others were performed after skin closure, and Hutchins and colleagues39 used liposomal bupivacaine. There were not enough studies to differentiate further whether any particular variant of TAP block might be more effective than others, such that a universal recommendation cannot be given at this point. Analgesics adjuncts which have been suggested as potential options include ketamine and intravenous lidocaine infusion. These approaches are not recommended for laparoscopic hysterectomy because of inadequate procedure-specific evidence. In addition, the benefit of adding these drugs to the recommended pain management regimen (box 1) has not been evaluated. Perioperative interventions in time to secure analgesia in immediate postoperative period. Non-selective NSAID or COX-2 selective inhibitor. Single dose of dexamethasone, intravenously. Acetaminophen (paracetamol) and NSAID or COX-2 selective inhibitor. COX, cyclo-oxygenase; NSAID, non-steroidal anti-inflammatory drug. General anesthesia is the standard of care for laparoscopic hysterectomy, and from an acute pain standpoint the choice of maintenance anesthetics has no detectable effect on postoperative pain, such that the main determinants for choosing the maintenance anesthetic agents are patient-related, such as cardiovascular comorbidity and the risk of PONV. With respect to the surgical technique, limited data suggest that minilaparoscopy may lead to lower postoperative pain scores. Measures to lower peritoneal insufflation pressure or humidify or heat insufflated gas may help to reduce the incidence of shoulder tip, but not abdominal, pain. Our study confirms and expands on the results of a prior systematic review focusing on non-opioid analgesics.8 Similar to this study, we found opioid-sparing effects of non-opioids such as acetaminophen, NSAIDs, and dexamethasone, and ambivalent evidence for regional techniques. We respectfully disagree with the authors of this systematic review8 on the risk-benefit analysis of anticonvulsants, the opioid-sparing effects of which need to be weighed against increased risk of sedative side effects. The strength of our systematic review comes from the interpretation of the individual pieces of literature according to a predetermined methodology of the PROSPECT Working Group, with an interdisciplinary Delphi process to achieve consensus.9 80 This approach goes beyond a simple summation of results and seeks to interpret on the basis of background/baseline analgesic technique, side effects, and clinical context. The limitations of this study are related to the limitations of the included studies. Most of the included studies assessed “unimodal” analgesic therapies rather than broader and more comprehensive analgesic techniques. Ideally, control groups should receive an optimized analgesic regimen, and the added procedure-specific benefit of specific interventions should then be tested against this backdrop.81 Also, there was significant heterogeneity in study designs with respect to the analgesic regimen. The minimal clinically important difference (MCID) in pain score has been debated, and while some have suggested a cut-off of 20 mm on a 100 mm VAS, or 30% on the NRS,82 some have argued for 10 mm14 and others have advocated individualizing MCID to baseline pain.83 We chose 10 mm as our defined MCID in accordance with the recent study by Myles and colleagues,14 who postulated 10 mm to be the MCID, and an absolute score of 33 mm on a 100 mm VAS to signify “acceptable pain control.” Although most studies report pain at rest, studies reporting pain on activity would be more suited to judge recovery from surgery with respect to mobilization. The primary outcome measures for systematic reviews by the PROSPECT Working Group are pain and opioid consumption. Although these parameters have been used in clinical research for the past decades, future studies and systematic reviews need to link these measures of pain with more far-reaching outcome parameters, such as mobilization, length of hospital stay, the incidence of complications, and the occurrence of chronic pain or chronic opioid consumption. Summarizing these considerations, we often do not use the most effective method to treat pain (eg, combined femoral and sciatic nerve blocks for knee arthroplasty),84 but the one we consider most appropriate after weighing risks and benefits.85 The present recommendations take this into account by suggesting a framework of basic analgesic interventions, supplemented by rescue medications, that can serve as a gold standard which can readily be implemented and against the backdrop of which future interventions need to be tested.10 Also, as individualized treatment plans seek to take into account patient-specific factors such as chronic pain,6 or pre-existing opioid therapy,86 our recommendations can serve as the common basis from which to tailor and adapt analgesic plans. In summary, although considered less painful than open abdominal hysterectomy, laparoscopic hysterectomy requires standardized postoperative pain management, particularly in the early postoperative period. The PROSPECT recommendations provide clinicians with supporting arguments for and against the use of analgesic interventions for laparoscopic hysterectomy (table 3). A balance of the analgesic efficacy and potential risks of the analgesic intervention determines these recommendations. Perioperative pain treatment for laparoscopic hysterectomy should include, unless contraindicated, acetaminophen and an NSAID continued into the postoperative period primarily for their ability to reduce opioid use, dexamethasone for its ability to decrease analgesic use and act as an antiemetic, and opioids as rescue postoperatively.
. Laparoscopic-assisted vaginal hysterectomy vs abdominal hysterectomy for benign disease: a meta-analysis of randomized controlled trials. Eur J Obstet Gynecol Reprod Biol 2011;159:1–18.
. Oxycodone versus fentanyl for intravenous patient-controlled analgesia after laparoscopic supracervical hysterectomy: a prospective, randomized, double-blind study. Medicine 2017;96:e6286.
. Transversus abdominis plane block for postoperative analgesia in patients undergoing total laparoscopic hysterectomy: a randomized, controlled, observer-blinded trial. Anesth Analg 2016;123:488–92.
. Efficacy of ultrasound-guided transversus abdominis plane block in laparoscopic hysterectomy. clinical trial. Rev Esp Anestesiol Reanim 2017;64:257–61.
. The effect of timing of dexamethasone administration on its efficacy as a prophylactic antiemetic for postoperative nausea and vomiting. Anesth Analg 2000;91:136–9.
. Trends in practice and safety measures of epidural analgesia: report of a national survey. Acta Anaesthesiol Scand 2018.
. Systematic reviews and meta-analyses of randomized controlled trials on perioperative outcomes: an urgent need for critical reappraisal. Anesth Analg 2015;121:1104–7.
. Pain management modalities after total knee arthroplasty: a network meta-analysis of 170 randomized controlled trials. Anesthesiology 2017;126:923–37.
. Low-dose ketamine for acute pain management: a timely nudge toward multimodal analgesia. Reg Anesth Pain Med 2018;43:453–5. Presented at Interim data from this analysis were presented at the 36th Annual Meeting of the European Society of Regional Anaesthesia and Pain Therapy (ESRA), Lugano, Switzerland, September 2017. Contributors JT, PL, and M-PB conducted the literature search and analyzed the retrieved articles with FB. JT, PL, FB, and GPJ wrote the manuscript, which was reviewed and edited by all the other authors, who have also participated in the PROSPECT Working Group meetings using the Delphi method, and in defining the methodology of the PROSPECT group. Funding PROSPECT is supported by an unrestricted grant from the European Society of Regional Anaesthesia and Pain Therapy (ESRA). In the past, PROSPECT had received unrestricted grants from Pfizer (New York, New York, USA) and Grunenthal (Aachen, Germany). Competing interests GPJ has received honoraria from Baxter, Mallinckrodt, Pacira, and Merck Pharmaceuticals. FB has received honoraria from Pfizer, The Medicines Company, Abbott France, and Nordic Pharma France. Henrik Kehlet has received honoraria from Pfizer and Grunenthal. The Anesthesiology Unit of the University of Western Australia, but not Stephan Schug privately, has received research and travel funding and speaking and consulting honoraria from bioCSL, Eli Lilly, Indivior, iX Biopharma, and Pfizer within the last 2 years. Narinder Rawal has received honoraria from Baxter and Sintetica. Data sharing statement All data will be available on the website: www.postoppain.org. © American Society of Regional Anesthesia & Pain Medicine 2019. No commercial re-use. See rights and permissions. Published by BMJ. This is an Open Access article distributed in accordance with the Creative Commons Attribution Non Commercial (CC BY-NC 4.0) license, which permits others to distribute, remix, adapt, build upon this work non-commercially, and license their derivative works on different terms, provided the original work is properly cited, an indication of whether changes were made, and the use is non-commercial. See: http://creativecommons.org/licenses/by-nc/4.0/.